Super Bowl LIII (53) is set to start at 6:30 PM EST on February 3. The New England Patriots and the Los Angeles Rams are both making return visits to the Super Bowl, and the heavy-hitting match-up is likely to be intense. You can thankfully watch Super Bowl 53 live online for free through Kodi. 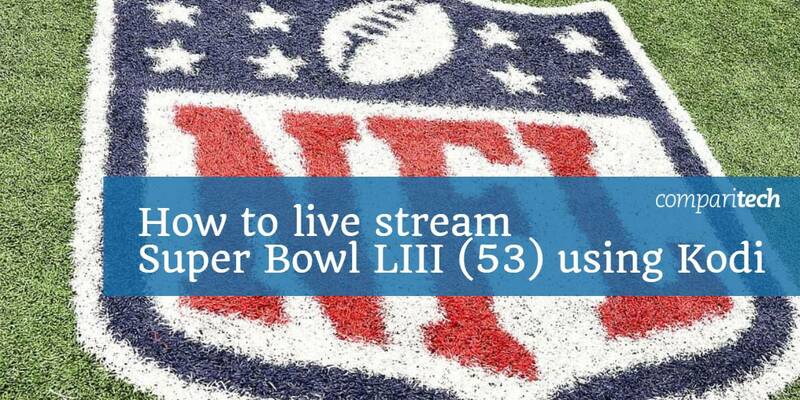 This guide will walk you through getting live access to the Super Bowl from anywhere in the world. It’s that time of year again. The pinnacle of football events is just around the corner. Super Bowl LIII (53) will feature the New England Patriots and the Los Angeles Rams. The event will take place on Sunday, February 3, 2019. The official kickoff is scheduled for 6:30 p.m. ET. Please note that we will only be recommending official sources. Many Kodi addons will attempt to broadcast live sports, such as the Super Bowl, through unlicensed streams. However, unlicensed streams are often inconsistent and laggy. Additionally, some addons carrying unlicensed streams may also install malware to your machine. It’s easy to watch Super Bowl LIII (53) from anywhere and for free, so there’s no need to turn to lower-quality streaming addons. To watch the fight for free on Kodi, you’ll need a VPN unless you’re in the US, UK, Germany, or Canada. but NordVPN and CyberGhost are both trustworthy, low-cost alternatives. Install the Kodi app and your desired Kodi addons onto your preferred device. Connect to one of the VPN’s servers in your home country. Try to connect to your preferred streaming source for the Super Bowl (if possible — live streams might not be available until the game starts). Super Bowl LIII (53) will be broadcast live, so it’s important to test your VPN before the game starts. You may need to test it on a different service given some of the free live streaming options may not be available until 6:30 PM EST or slightly before then. As mentioned above, users with British IP addresses can watch the Super Bowl for free on BBC iPlayer. To stream iPlayer content on Kodi, check out the iPlayer WWW addon. 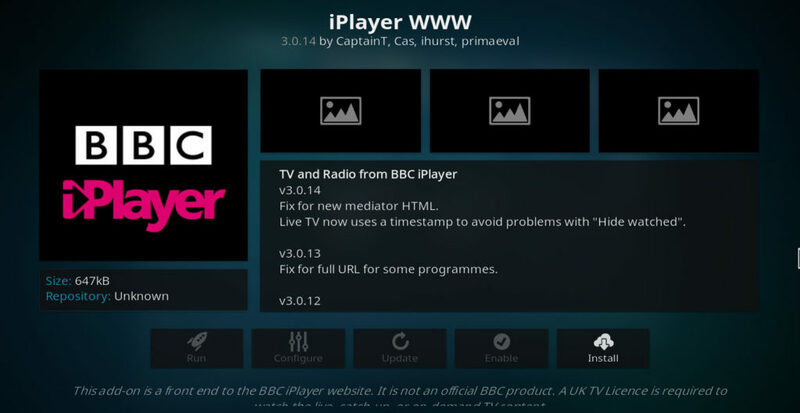 Learn how to install it and get set up with our tutorial on how to watch BBC iPlayer on Kodi outside of the UK. The DAZN Kodi addon allows you to access all your favorite live and on-demand DAZN content from Kodi. Bear in mind that you will need an active DAZN account and, if you’re outside Canada, a VPN that reliably unblocks DAZN like ExpressVPN or NordVPN. 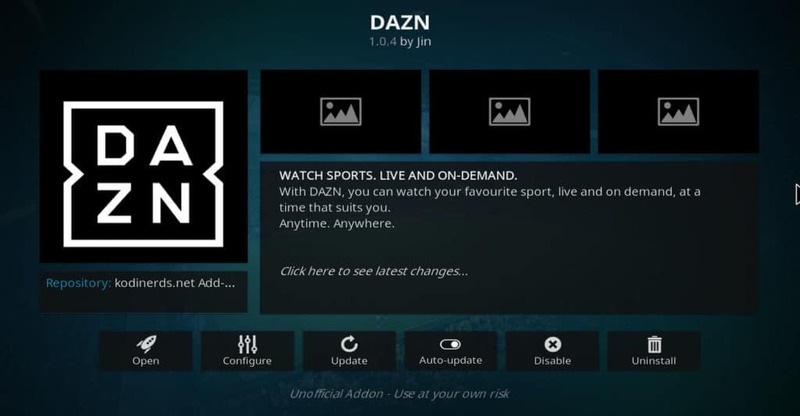 Learn how to install the addon and get set up with our tutorial on how to install DAZN for Kodi. As mentioned earlier, Locast offers live broadcasts of over-the-air channels completely for free over the web. You can access Locast through a Kodi addon as well. 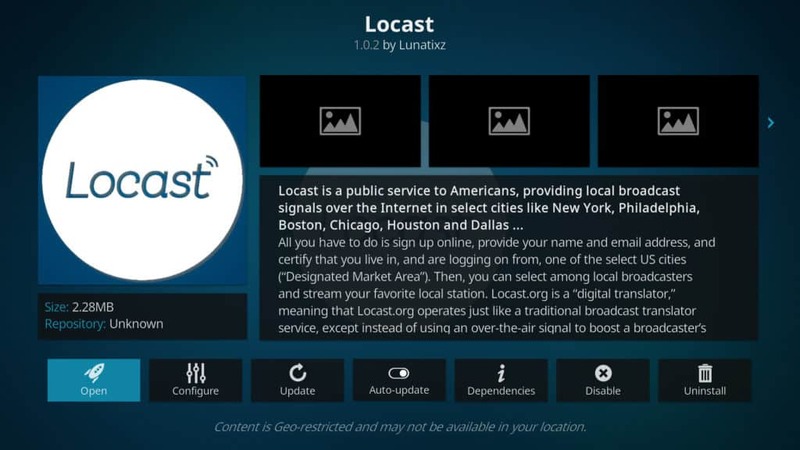 You’ll need to login to your Locast account to use it through Kodi. 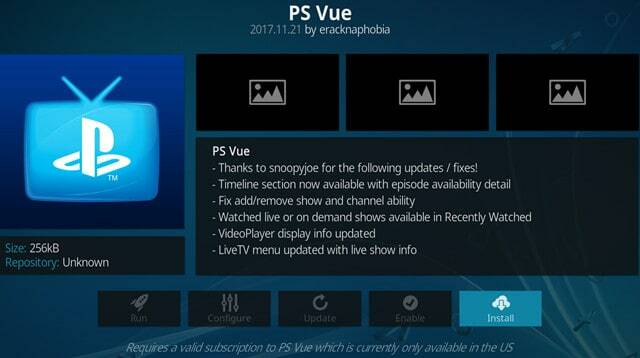 PlayStation Vue subscribers can access all their live and on-demand streaming content from Kodi using the PS Vue addon and CBS’s channel therein. PS Vue is part of the official Kodi addon repo, so there’s no need for any third party repositories or installers to get it up and running. Just install it and enter your account credentials. PlayStation Vue subscriptions start at about $40 per month, and a free trial is available. The PlayOn Browser Kodi addon recently added support for DirectTV Now subscribers, so you can access all the live and on-demand content from that service through Kodi. DirectTV Now bundles include NBC Sports, which live streams the Super Bowl. 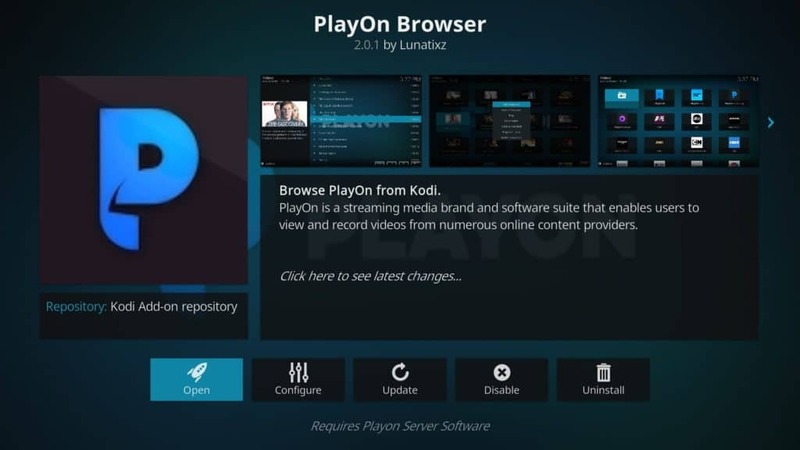 Check out our tutorial on how to install and use the PlayOn Kodi addon for more info. 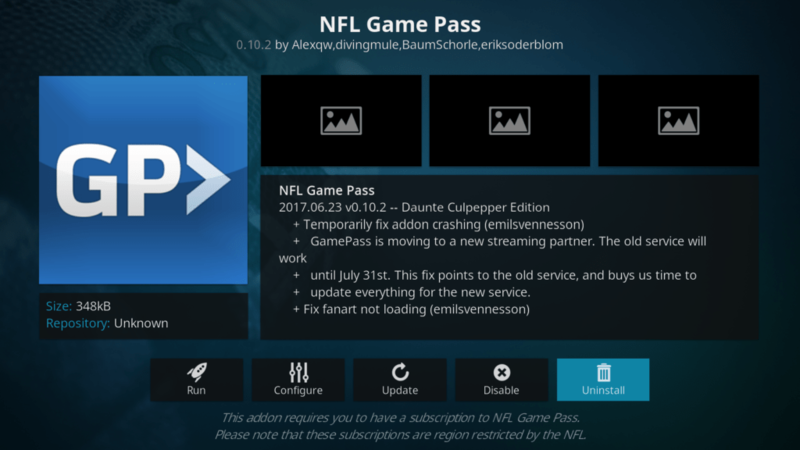 If you don’t mind watching a replay, the NFL Game Pass Kodi addon is available through the Official Kodi Addon Repository. Just connect to your account using your login information, and you’ll be ready to stream NFL games including this year’s Super Bowl. NFL Game Pass costs $49.99 as of time of writing, and a free trial is available. This is a US-only service, so viewers outside the US will have to use a VPN to unblock it. If you are not a Kodi user, you can see some alternate ways to watch the Super Bowl online here. When streaming on Kodi, it’s always a good idea to use a VPN. A VPN will encrypt your internet traffic and route it through a server in a location of your choice. This has the effect of masking your online identity so your ISP cannot see your online activity and even enables you to access geographically restricted content. IPVanish is great for privacy, supports all Kodi Add-ons, offers high speeds and has a 60% discount available here. However, some streaming sources may block IPVanish servers, so we’ll make a note if another VPN service is necessary. Even if the streaming source is official and legal, the add-on itself is probably made by a third party. Some Kodi add-ons can get hijacked by third parties or existing developers who add malicious updates. It’s almost impossible to tell when this happens for users. From there, the hacker may implement a man-in-the-middle attack which allows the hacker to view your data streaming activity, gather your data, and in some cases even gain access to your device. A VPN can help protect you from these bad actors. Many ISPs are increasingly implementing speed throttling on streaming video. If your ISP throttles your bandwidth during the Superbowl, you could miss the action while the stream buffers. A VPN hides where your data is coming from and going to, making it difficult for the ISP to determine that you’re using video data and reducing the risk that you’ll face speed throttling. Your Firestick is going to be one of the best devices to use for the big game. You can easily watch Super Bowl 53 on your Amazon Fire TV or Fire TV Stick thanks to the available apps and the Silk browser. You can download and install Kodi onto Firestick and run any of the aforementioned add-ons through your device. Additionally, ExpressVPN and several other VPN services now have apps for the Firestick that you can use to bypass geographic content restrictions.